This leaves me to a week of flying solo. Of shamelessly dancing around to country music, of reading horse fiction for hours, of eating eggs morning, noon, and night. There are power naps, disco naps, napping with a bag of truffle popcorn. And of course, there is the chance for quiet moments, for contemplation, and for happily bumping around the kitchen, all to myself. If you’re a frequent reader of Shut Up and Cook | The Attainable Gourmet you know that my obsession with Caesar salads borders on embarrassing. However, and though I’m loath to admit it, there are times when a dressing that requires a cup of oil is just not going to cut it, particularly with bikini season looming its head right around the corner. This Skinny Caesar Salad Dressing is a wonderfully lightened up version of the old classic; sharp pecorino is balanced by the acidity of the lemon, the kick of the garlic, and the earthiness of the anchovies. Serve it when you’re on your best behavior, even if no one is looking. Combine the garlic, anchovy fillets, and lemon juice. Allow to sit for 10 minutes. Using an immersion blender, add the olive oil in a slow stream until creamy and emulsified. Season to taste with salt and pepper. Set aside. 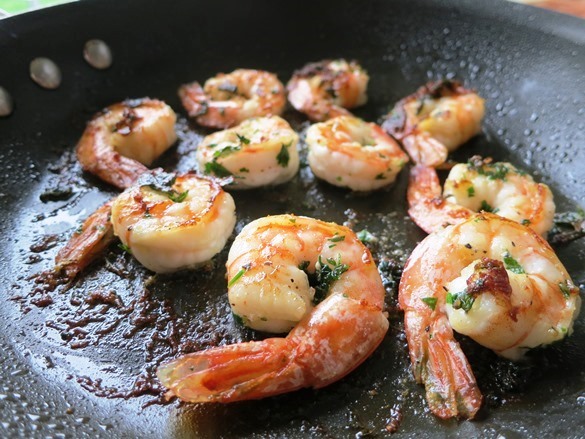 On the grill, or using a dry, hot cast iron skillet, cook the shrimp until pink and firm, and just cooked through about 2-3 minutes per side. 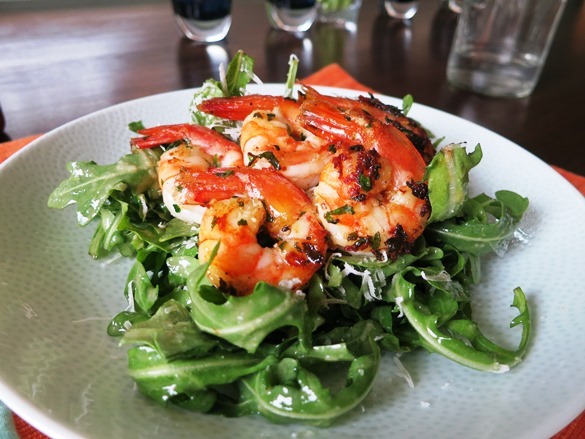 Toss the arugula with the salad dressing, divide among plates, top with shrimp and finish with generous grating of pecorino. I love Caesar salads too and this looks incredible. The first time I had one was at the great place in Savannah, Ga called The Shrimp Factory… They put it together and toss it the dressing right at your table. Its was so amazing I’ve been hooked on Caesar salads ever since. This looks so light and perfect. Love the table-side assembly Keisha! Caesar is something that I order again, and again, and again. This is definitely a lighter version than my creamy favorite, but it’s a good healthy option. I just had twins, so when they sleep, I repeat “when they sleep”, I look at food blogs. I love your blog. I’ve been through so many and I really like your blog and “Cooking With Mr. C. on Wprdpress”. Thats a combo food/celebrity blog. Lots of fun. I look forward to checking in with all of your recipes. Congrats on your twins, Lillian! That’s so exciting. I’m very honored to have a sliver of your time to read my blog. Any recipes in particular you’d be interested in getting? Don’t hesitate to put in your requests. Caesar is always a favorite and a standby. It was the first salad my kids would eat. And I love the idea of it being unadulterated. No worcestershire, no mustard, just good “caesar” flavor! Have fun while they are gone! This is definitely Caesar-Lite, but it’s a good one to have in the rotation! Enjoying the peace and quiet, for sure, but will be glad when they’re back as well. Cooking for one is not nearly as much fun! Making this ASAP. I am almost equally caeser obsessed. The shrimp look awesome too! Those grilled shrimp look amazing! Why thank you! So easy…Costco has great jumbo raw shrimp, de-shelled, but tail on that I really like. I can’t get enough of Caesar salad either. 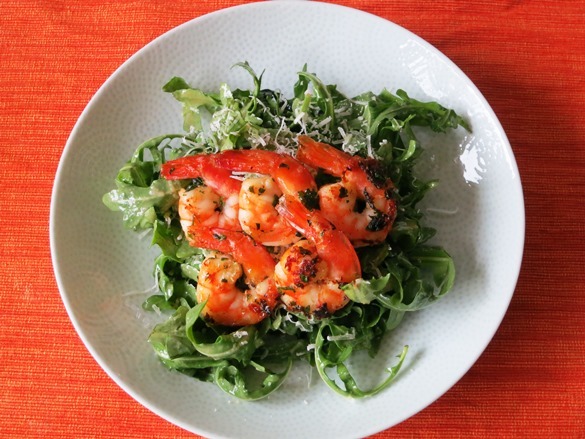 This looks great – fabulous looking shrimp! Good stuff – thanks. Thank you John! The shrimp were indeed a perfect addition, and so easy to boot! Love your skinny Caesar dressing, Erina! I’m crazy about Caesars, as well, (I’m an extra anchovy gal) and can’t wait to make this one. Enjoy your solo adventures at home and boogie down in the kitchen! Thank you Hannah! I indeed have been boogying…much to my neighbors amusement I think, but what do I care?! Love this lighter version of Caesar — the perfect not-so-secret single food! 🙂 Enjoy your week of flying solo. Simple Perfection! 🙂 Love it!